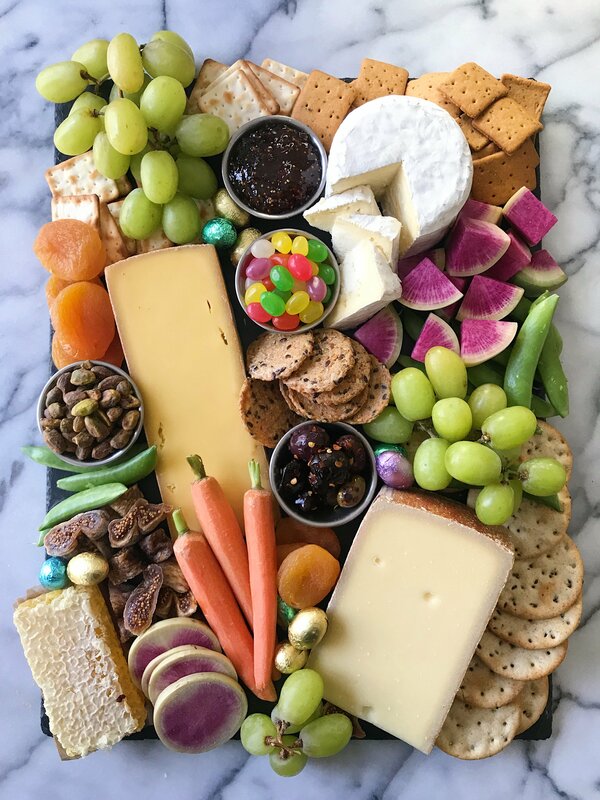 When my family arrives for a holiday or celebration of any kind, some of them head straight for the cheese board! It is place to gather, settle in and enjoy good conversation so I always make sure it has something for everyone. And it’s always a hit because it has it all going on and always has a few things to make this seasonal and fun. This one has one soft cheese (forgot the name! 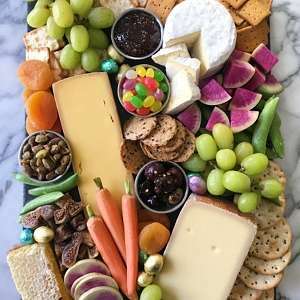 ), two hard cheese (Challerhocker and a gouda), several types of olives, dried figs, dried apricots, fig jam, honey comb, fresh grapes, carrots, watermelon radishes, snap peas, pistachios, jelly beans, chocolate eggs and 4 gluten-free crackers– Absolutely Gluten-Free original, Breton Gluten-free Original with Flax and two types of Mary’s Gone Crackers. Truth be told, I used to be intimidated to make a cheese board but I’ve learned some tricks along the way to keep it simple. Caveat: I am by no means a cheese expert. The cheeses I’ve chosen were recommended by a cheese store. So definitely ask your local cheese store or cheese department of your local store for recommendations… they will often let you tastes the cheese as well. Add something seasonal! Here we added jelly beans and chocolate eggs.